Be taken to another world of relaxation and beauty with our top therapists and spas. 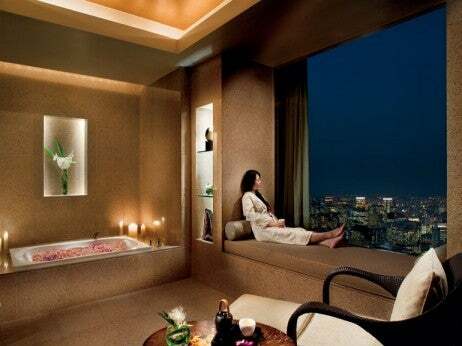 Treatment and facilities: The Ritz-Carlton was first to introduce ESPA – the British brand – to Japan. Encompassing 21,000 square feet, it offers guests a luxurious spa, state-of-the-art fitness facilities and equipment, an indoor pool, dry sauna, steam sauna, nine spa treatment rooms, one spa suite (ideal for two people) and a fitness studio. There is also the option to purchase a club membership providing special privileges, including a private lounge, and personal training sessions. Signature treatments: Jet-lag reliever – to relax muscle tension and rehydrate the body after a long flight, therapists use specially selected aromatherapy oils to either aid sleep or invigorate and awaken the body. Treatment and facilities: This contemporary spa encompasses separate steam rooms and Japanese onsen baths for men and women, in addition to its private therapy rooms and intimate relaxation rooms. Signature treatments: Kohaku Gold & Amber – This treatment promises to repair skin and restore its ion balance. To do this a negative ion from nanonized gold penetrates the skin and exfoliates the skin for a brighter complexion. The skin is then massaged using amber stones to deliver organic energy. The antioxidant effects are felt on your face as a result. 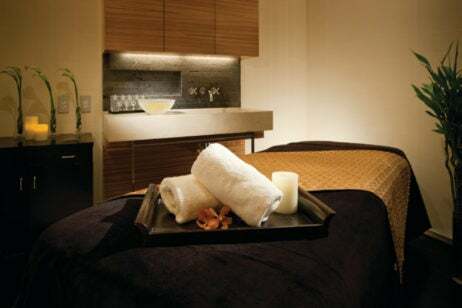 Treatment and facilities: The Peninsula Spa by ESPA occupies the sixth floor of the hotel and consists of a spa reception area, nine treatment rooms, and separate changing, relaxation and thermal suite areas. The thermal suites area offers crystal steam rooms, dry saunas and aromatherapy “experience” showers. The warm earthy tones and “washi” paper light fixtures create the perfect environment in which to revitalize body and mind. Signature treatments: The Keihatsu Enlightenment Massage – Developed especially for the Peninsula Spa this holistic massage evolved from the ancient traditional techniques used by Nihon Kaifuku Anma. An Influence of Shiatsu – This massage was developed with the shiatsu lecturer and practitioner Rosamunde Jordan and is intended to help enhance the body’s Qi and restore equilibrium. Treatment and facilities: CHI, The Spa at Shangri- La draws inspiration from the Shangri-La legend. Featuring six serene private spa suites in a tranquil corner of the hotel this spa’s two specialty suites offer stunning views over Tokyo. The extensive spa menu consists of award-winning CHI massages and treatments. Signature treatments: Kisetsu Ritual – This treatment is only available in Japan and is inspired by a unique appreciation of the seasons so guests will have different experiences at different times of the year. Yang Chi Energizer – Inspired by traditional Chinese medicine, the deep tissue techniques focus on stimulating specific points to improve blood circulation, alleviate stress, help to loosen knots in the muscles, relieve pain and improve mobility. Treatment and facilities: Tokyo Massage – starting with a foot-cleansing using rare stones derived from Mount Fuji, a combination of Japanese massage techniques and hand compressions are used to break down tension throughout the entire body. Special oils are applied to stimulate circulation, followed by warming of the entire body with a personalized stretch session, and a back or focused area massage. Signature treatments: An oasis of calm in Tokyo, the Club on the Park experience is one that comes with sweeping views, generously-appointed spaces and exquisite pampering by dedicated spa and fitness specialists. The 45th floor is devoted to tranquility of body and mind, with spacious relaxation areas and private suites where an extensive range of tailored aesthetic treatments, including the unique Vichy hydrotherapy, may be enjoyed. Treatment and facilities: The superior quality of Kusatsu Onsen’s water has been widely recognized since ancient times. It has been identified as one of Japan’s top three locations for hot spring water and can be found just two hours away from Tokyo. 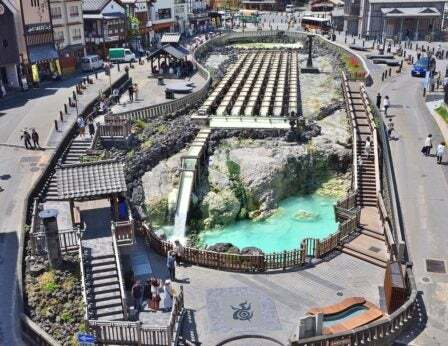 It is because the therapeutic benefits of Kusatsu’s water are so high that the traditional Kusatsu folk song praises it as being able to ‘cure everything but love sickness’. Treatment and facilities: Located 90km south west of Tokyo, in the grounds of the summer residence of a former member of the imperial family, Gora Kaden has two wells from which hot mineral rich water flows. The spa is located in the Japanese garden where the tranquil atmosphere soothes both body and soul. Treatments include relaxing massages and stone therapy, all preceded by a long soak in the onsen to prepare the skin.